The Bottom Line: Kim Telegraphs His Attack On The U.S.
Kim Telegraphs His Attack On The U.S. Locked in a battle of maneuvering and harangue with Trump, Kim has now attached a time line and an exact target to its threats to attack the Pacific island of Guam. He says he not actually going to hit Guam. I guess he wants us to believe this is just another test like the last one that came within a 130 miles from the coast of Japan. The picture at right is Kim with his Hwasong-#12 ICBM missile. Guam, since the 1940’s has been a U.S. territory, and home to a massive American military installation and more than 160,000 civilians. “North Korean state media reports plan to launch four missiles at Guam by mid-August as presented by Kim Jong Un,” Britain’s Sky News tweeted late Wednesday. A North Korean statement issued Wednesday U.S. time, and Thursday Korean time, explained the plan further. 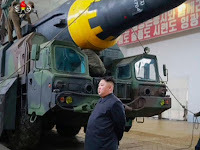 “The four Hwasong-#12 rockets to be launched by the KPA (Korean People’s Army) will cross the sky above Shimane, Hiroshima and Koichi Prefectures of Japan,” the report said, citing General Kim Rak Gyom, commander of the Strategic Force of the KPA. “They will fly 3,356.7 km (2,085.8 miles) for 1,065 seconds or about 18 minutes and hit the waters 30 to 40 km away from Guam,” the report said. The question is: Does N’Korea have the sophisticated guidance system capable of that kind of accuracy? Guam replied with defiance to North Korea’s statements. Guam Homeland Security Adviser George Charfauros said the island can defend itself. “They’ve slowly developed their capabilities but we stand in high confidence with the U.S. (Defense Department’s) ability to not only defend Guam and the surrounding areas but also the continental U.S. … There are several layers of ballistic missile defense,” he said. “We always maintain a high state of readiness and have the capabilities to counter any threat, to include those from North Korea,” Lt. Col. Christopher Logan, a Pentagon spokesman told Business Insider. THE BOTTOM LINE: I don’t know what the redline is for Trump, but this would be mine for sure. There are three places the U.S. could intercept these four missiles, one is from S’Korea and possibly right on the launch pad at Kusong. The next would be from Japan and the last resort, from Gaum itself. In addition I am told there is actually a possible fourth place and that is from the Philippines. But despite all the optimism about the defense capabilities of the U.S., the previous tests at intercepting missiles is still problematic with less than a 40 percent success rate and those were under ideal conditions. Moreover shooting down four incoming missiles quadruples the threat as well as increasing the complexity. We should have been practicing shooting down N’Korea’s test missiles all along. It’s kind’a like trying to shoot a bullet with another bullet. How does one distinguish a test from an attack? U.S. Pentagon In Bed With Terrorists…Again! Oh To Be A Frog!